Hi there. My name is Erin and this is my 3 year old son Sebastian. 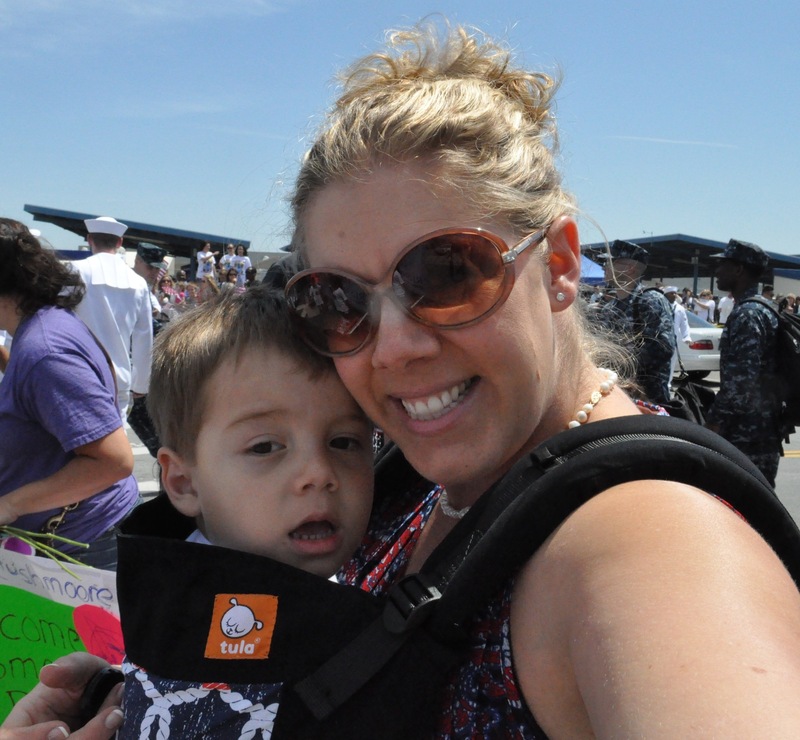 Here we are in sunny San Diego at the Homecoming for the USS Rushmore on May 14th, 2013. For the past 8 months my husband, his Daddy, had been deployed on the ship all over the big blue ocean. We had prepared for 8 months for him to come home. Lots of long months, weeks, days, hours and even minutes. The last few weeks it was getting the house ready, getting us ready. Even little things like what to wear on the day. The night before, at 11pm, I realized that my go to carrier (a Folk Birds Tula) was going to CLASH with us…what’s a Babywearing Mamma to do? Frantically message her Babywearing Mama friends, that’s what! The first friend didn’t have what I was looking for so she sent me to the Ula, the owner and creator of Tula Baby Carriers who happens to also live in San Diego. The next morning I heard back from her and she so graciously invited me to come and see what might work. In a rush, on our way to meet the ship, I stopped by and she had multiple beautiful carriers to pick from…she even “double dipped” coming back with more options when the first ones weren’t quite right. I settled on the perfect one, navy blue with rope, how much more “Navy Homecoming” can you get? I said a quick Thank You then headed down to the Naval Base. The level of nerves and excitement was high all around. My son had been lucky enough to win “First Hug” so he’d be near the front of the line to see his Daddy. As the time came closer the buzz around us got bigger. He looked up at me and said “It’s scary, pick me up please.” I asked if he wanted to go in the carrier and he quickly said yes, which is a rarity these days. We used the carrier a few more times that day and I’m so very thankful she let us borrow it. I was wearing him when he got to first see his Daddy up high on the ship and the look of happiness on his face with his screech of joy was priceless. I cherish these moments as I know they are becoming fewer and fewer.